This is not an innerspring mattress, rather it is a foam mattress. The foam in the mattress is hypoallergenic and extra-firm (as recommended by most medical experts). It is lightweight and waterproof (can be wiped clean with a damp cloth and mild soap) with a triple layer nylon reinforced vinyl cover (anti-dust and tear resistant) and cloth binding (for strong seams). The mattress dimensions are (L x W x H) 52 inches x 27.5inches x 5 inches, and the corners of the mattress are built square to better fit in a crib. The Colgate Classica 1 also boasts eyelet vents to help promote mattress breathing and freshness. The Colgate Classica I Crib Mattress is made in the USA and it passes all federal flammability standards and Consumer Product Safety Improvement Act standards. You can read a brief summary of Section 104 - Standards and Consumer Registration of Durable Nursery Products of the CPSIA here. This mattress is very similar to the Colgate Classica 1 Mattress, however the hypo-allergenic polyurethane foam is made with plant oils as opposed to petroleum oils – marketing materials for this mattress indicate that the manufacturing process for foam made with plant oils uses less energy and produces less carbon emissions. 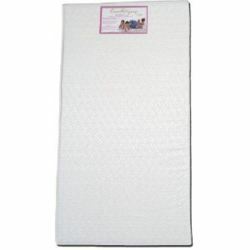 The mattress also has a wetproof cover that is made from bamboo, however a waterproof mattress cover is recommended.